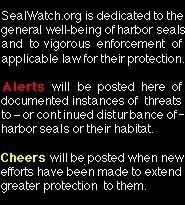 SEALWATCH.ORG - Why Seal Watch? The SealWatch.org website was begun in the early 2000s by Daliel Leite in the San Francisco Bay Area to call attention to the challenges faced by Northern California harbor seals (Phoca vitulina) along the Pacific coast from Point Lobos to the Russian River. What was started as an advocacy and support effort for several major local seal populations and conservation programs rapidly expanded. It quickly became obvious that more than just "our" California harbor seals were being threatened by human-caused disturbance and habitat degradation. From Denmark, to The UK, to Maine we learned of devastating disease, fishery-based "culling", recreational disturbance, and other concerns. We also discovered the tremendous attention and effort that is being devoted to harbor seal welfare through education in New York, volunteer action in Rhode Island, legal processes in California, scientific research in Alaska, and much more around the world. It became clear that to be worthy of its name, this website needed to link information about all these programs — their successes and immediate challenges — with others around the hemisphere who would support and encourage them. The result is SealWatch.org, a volunteer, non-professional, citizen-scientist project which neither requests nor accepts financial donations. It exists solely to further the work of others. If you are visiting this site, please act and speak on what you find here. We who care are the best protection that harbor seals can have.